Down One Bourbon Bar & Restaurant® is a unique bourbon experience in Louisville, KY. With a speakeasy theme, Down One is nestled in the middle of Louisville’s Historic Whiskey Row. Relax on our patio lined with magnolia trees, enjoy a beef brisket biscuit sandwich and sip on a bourbon, beer or one of our delicious cocktails. This former underground parking garage features one of Louisville’s hottest and only bourbon bar along the historic Whiskey Row in Louisville, Kentucky. Starting March 22, enjoy live entertainment every Friday, 4pm-8pm and 1st & 3rd Saturdays, 6pm-10pm. Try and guess your bartender's favorite choices. You think you know bourbon; here is your time to show it. Chips and quest were good but the burger was not my favorite. Chewy bacon, unmelted cheese and not cooked to the temp requested. Overall, not bad but I would try other things first before I returned. On the plus side, they have a nice selection of bourbons and other drinks available. Local beer choices too and is really convenient to the arena and local theaters. This place was wonderful. We went with an out of town work group to show them some of Louisville and the Urban Bourbon Trail. The food was REALLY good and the drinks were yummy. There were only 2 negatives. the first is the noise level was a little much to continue work conversations. And the second is we were wanting to provide a good bourbon experience to the out of towners, but our server said she didn't know anything about bourbon and couldn't make any good recommendations. It was fine for what we were doing. They have a good selection of bourbons (little pricy for the pour but not unreasonable) food was good, service was lacking. I'm just assuming the waitress was new, I may try again, not sure. Yes, but not prior to a game or event at the Yum Center. It was way too crowded and the noise level was over the top. Couldn't even talk to each other. We would like to go back when there is not an event taking place.. The drinks and food were good, but difficult to enjoy them due to the crowd. It's a bar with bar food, not much more. Was disappointed that my first three selections from the bourbon menu were not available. Taco's were good, but not spectacular. Service was decent, just a little slow given the events going on in town for the weekend. I would go back again, just with lowered expectations before my first visit. Liked food & atmosphere, but service was very very slow. So many places these days do not want to sell beer it seems. Trip to Louisville for the NCAA Tournament. Great selection of bourbons, of course! Great appetizers and food. Very friendly wait staff. Live music when we were there Friday night. I and a guest each ordered different “flights” of bourbon. Our server was excellent in recommending different choices for each of us! I was impressed with how knowledgeable she was! Great ambiance, conveniently located close to Actors Theatre. The food and cocktails were excellent. Dinner was great, drinks were great, fun yet relaxing atmosphere. Only thing was the banana pudding wasn't available, which was a bummer! Otherwise, we enjoyed our dinner here and will look to return in the future. The food was delicious, and our server Ryan was great! This was a last minute reservation we were able to get. The food was delicious but I did have a couple complaints. The first one was the condiment bar- if you’re paying a higher price for food, I don’t think you should have to go get condiments yourself. My biggest complaint was the service. We sat at our table for over 5 minutes, with several servers passing us by. Nobody came to get our drink order. I finally had to ask the hostess who our server was and she went to get someone. A server finally came over (apologizing) to say she would take care of us because our server was busy. The waitress we had was great but it was a little disappointing it took that long (when there were only 4 other tables around us, and 5 different servers passing by us). The cheeseburger and side salad was delicious though and the food came out quickly! Unless you're in Louisville for a convention and need to vent after a day of meetings-this is not a place to relax and have a quiet evening with conversation. I must say up front, we do not drink bourbon-so we can't comment on their bourbon menu. The dinner menu is fairly basic bar type food. My tacos were uneventful and pretty dry-I did go to the condiment bar and get some extra salsa though-My fish sandwich also needed some help, but we asked our waiter for some tartar sauce and never got it- he was run off his feet with large parties. The noise level was out of control. We were forced to sit in the bar area as the dining room with normal tables had a group in it. That means you are at the very high bar tables and chairs, which means I can't touch the floor or the rungs of the chair with my 5'1'' height! The reason we chose Down One was its proximity to the Kentucky Center, so we could walk to a performance easily-at least that worked for us! Great pub food and easy location to get to The Yum Center for a concert. Food was great. The waiter we had was lacking however. We had to flag him down several times for service and had to ask twice for our check. Good spot for BBQ and such but VERY loud. Hard for us over 50 types! Specialty drinks dramatically reduced from the last time we were here. Disappointed they couldn’t make what I had previously. Great selection of bourbon but not all on the menu. 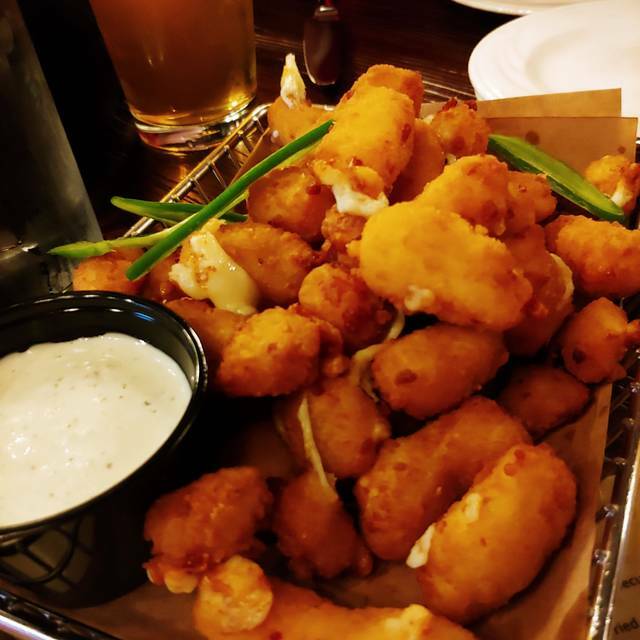 Had cheese curds as appetizer. Huge and very delicious. Ended up splitting a burger and was disappointed. Was barely warm and looked like a pre-made patty. No flavor at all. This is a great location but food has gone downhill. Service was great on a busy night. Food too heavy, greasy, and poorly executed. Salad could have been out of a grocery store bag. Gtreat food and nice atmosphere. We were in a hurry and the service was slow but our waiter was timely with our check when we asked. Second time we have been and both times have been disasters with food. First time the waitress didn’t seem to know much about the menu and the wait time after the orders were placed was an hour. The second time waiter was pleasant but got one order wrong and it it took over 40 min to bring the correct sandwich back. The problem was one person had food and the other waited way to long for the issue to be corrected. Nice downtown location but unfortunately that there seems to be a real issue with the kitchen. Unfortunately, this was not what I had expected. I kept feeling like we were at TGIFridays. The food was overpriced and only mediocre. We started with Chips and Queso. This was very straight forward but tasted like melted Velveeta with a little sausage added - nothing special. For my entree I chose the Adobo Chicken Sandwich. The menu was clear that everything was a la carte but I expected at least a garnish on the plate. I was served chicken with a blob of what they called pimento cheese. Being from the area, I expected some tasty pimento cheese. This was not edible - it was very heavy on mayo of some sort and did not have any flavor. The chicken itself was seasoned excellently but was incredibly dry. I was not able to eat more than 3 bites of it. For the price of the sandwich and the fact that it did not come with anything, I expected to be blown away by the taste. That did not happen. In additions, the cost was excessive for a "simple" chicken sandwich. On a positive note - the drinks were great! I think this is a place to be known for the alcohol beverages, NOT the food. Service was horrible. We sat down, our waiter came and we asked for a minute to look at the drink menu, we ordered drinks, then we sat and waited 45 minutes until we actually got our drinks. It was another waitress that brought our drinks and took our food order. Service was absolutely horrendous especially for a night where not many people were in there at all. It is hard to say. I might recommend, but i would set the expectation low for service. The bar tending was unacceptable. The restaurant was not that busy, yet we waited ten minutes for an Old Fashion. My wife's chocolate martini was a fizzy vodka and nothing close to chocolate. it was horrible. The menu is limited, but we understood this prior to making reservation. 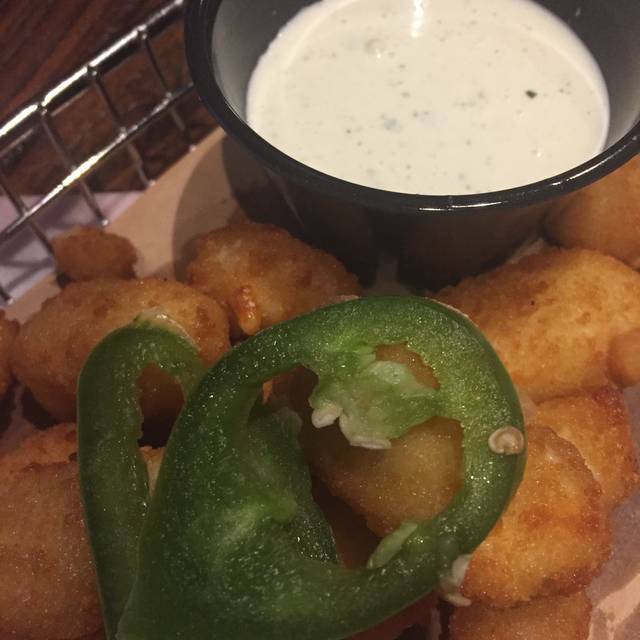 We noticed a lot of people recommended fried green tomato's. Unfortunately, they did not have fried green tomato's which shortened the selection of things on the menu since a few other items require Fried Green Tomato's. Went to eat here before a concert at the YUM! Center and for being right across the street from the venue the prices were very cheap and reasonable. Great taste and atmosphere. Solid option for dinner and drinks with friends before a Cards game at the Yum. Brisket grilled cheese was very good, my friends Hot Brown biscuit came out cold and wasnt very good. Our wifes had salads ... average. Sevice was slow but manageable. There are better options around the Yum, but I would come back because of proximity to the Yum. I would give it 5 stars except we sat by the hostess stand and she kept bringing people between us and the wall. About a 2 foot clearance and we had to stop eating every time. Good news bad news here. Great location between YUM and KY Center, across from ATL. Went there before Broadway show. Not crowded tonight which made the very slow service hard to forgive. I tried to be generous in my assessment, as other reviews have slammed the service, but there is no excuse tonight Waiter was polite but Inattentive, not rude, somewhat poor knowledge of menu. Took forever to get check, Never was offered any refills. Fries are plentiful, burger was fine not great. Excellent and quick service on a night a group of us were headed to see a show at Kentucky Center. Great deals during happy hour on the excellent bourbon cocktails. The food was well priced and delicious. First time back since they reopened and was glad to see a focused menu that was much cheaper but still an outstanding bourbon list. It is a nice atmosphere. Got in and out easily the food is good but it is very casual. Excellent location, great food! Great value! First visit here. Glad to find a casual place near YUM Center that takes reservations. Perfect place before game. Nice variety on menu. Good service. Definitely will be back. The menu is limited. Found chicken sandwich to be extra thick chicken pieces that would be on a salad slapped on a bun with only pimento cheese. Had to eat with a knife and fork. Drink glass was salty, when wiped of salt there was lipstick that came off on the napkin. Gross! Ordered a bottle of white wine and brought us the bottle to pour ourselves. Nothing to chill the wine in as it sat in the table. Won’t be headed back. Food was just mediocre but it’s a good place to get a drink prior to Ky Center for the Arts. Fried poutine was great with the fresh ranch. The hot brown turkey was underwhelming. Very dry biscuits and the cheeses sauce cooled very quickly. I suggest Serving it open face. I also tasted my sons brisket sandwich. That was great! Snaps to the bartender, bourbon he pours was fantastic. Don’t Go here for food; it is horrid! Server was inattentive, had to be corrected about our order several times, hardly checked on us until the end of our dinner.